Scapulohumeral rhythm. Sounds pretty cool, right? It is. As I mentioned previously, teaching an anatomy class has my head full of anatomy-related thoughts, and they all center around one basic concept/question: knowing the anatomy is important and all, but how do we use and apply this knowledge? Of course, your mileage may vary. Starting with your arms at your side, just how far your arm moves at the glenohumeral joint before the scapula begins to move differs slightly from person to person. And it varies with abduction compared to flexion. And, when you actually look at someone doing either motion (flexion or abduction), you’ll probably notice that from rest to moving, their scapula will twitch as the scapular stabilizers kick in. In our class practical, we asked the question: does that count as scapular movement? (We then noticed that the scapula remained mostly still for a bit…and then it really started to move). Let’s call it three things for the sake of simplicity. Upward rotation is serratus anterior’s job. So how does this show up in real life? I may be more than a bit biased here, but the part where it all gest practical and real is the exciting part. As a strength and conditioning coach for circus artists, I’m constantly observing things like the quantity and quality of their overhead range of motion as they perform various exercises or movements. This may well be true of some circus coaches. The difference is that I think I am generally in a better position to intervene, since everything that I do is built around the idea of making sure stuff moves nice and then making that nice-moving stuff really strong. That means that when shoulders don’t go all the way overhead, we get to take some time to explore and see what we can do. Reduce unwanted tone in overactive muscles. Practice new range of motion. Strengthen new range of motion. So, let’s say we’re looking at someone raising their arms above their head (and that they are conveniently wearing clothing that makes their shoulder blades visible). First, what are we seeing? We are, of course, aiming for full overhead range of motion (180 degrees). Actually, we need to be pickier than that because it’s more than just ‘is the arm at 180 degrees relative to the torso?’ We should also look at the scapula. Especially since this is a post about scapulohumeral rhythm. This is where it gets trickier. 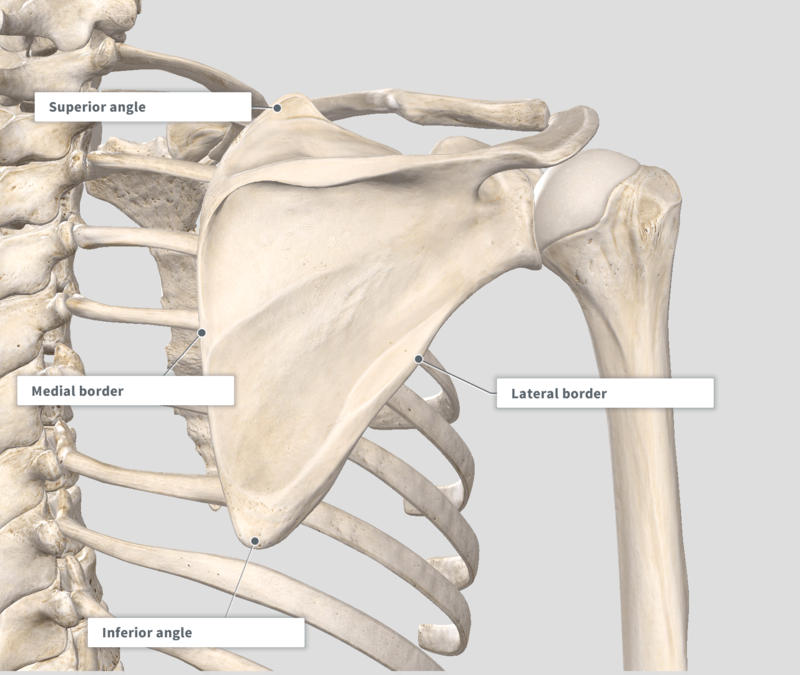 An easy thing to spot is the inferior lateral border of the scapula. 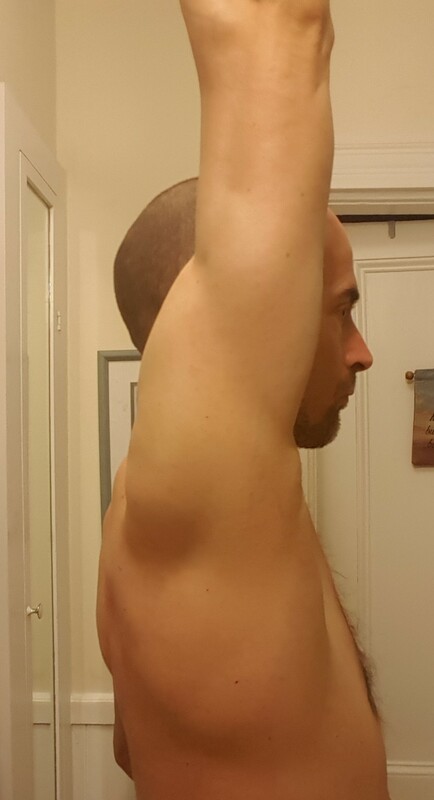 In full shoulder flexion, we should generally see that inferior medial border of the scapula coming to the mid-axillary line. Viewed from behind, we’re looking for the scapula to end up such that the angle between the spine and the inferior angle of the scapula to be somewhere around 55 degrees (in most settings, that’s 55 degrees as measured with the eyeball goniometer). Now then, with all of the boxes checked—arms fully overhead, scapula upwardly rotated—what next? From here, we reinforce the pattern. Usually—and by “usually”, I mean based on what we (meaning Theresa and myself) with the circus artists we work with—we begin with a basic one-arm “Y” in the prone position. 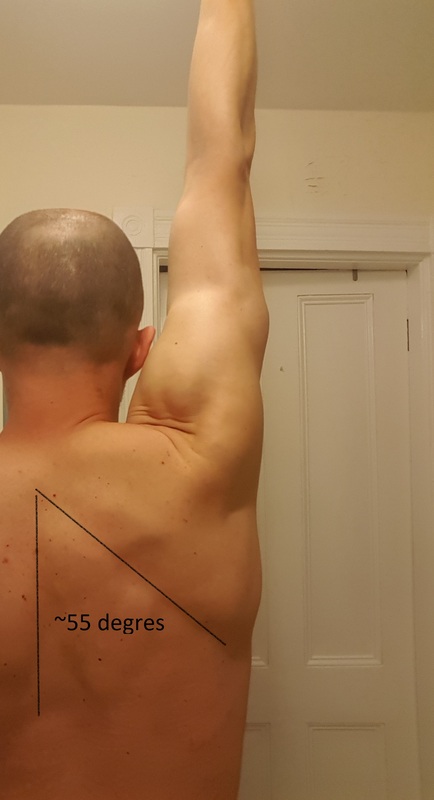 If we raise the arm overhead at roughly a 135-degree angle (in this case, half of a Y), we get the arm in line with the line of pull of the muscle fibers of the lower trap. The thing I like about this exercise is that it provides a great opportunity for giving some helpful biofeedback in the form of a tap on the lower trap. This also really helps with figuring out posterior scapular tilt (without unnecessary lat engagement). From there, we often progress to Back-to-Wall Shoulder Flexion. You can use this exercise as a quick self-assessment for your shoulder range of motion and then, you can rep it out as a way of improving it. That is, assuming this is the right exercise for you. (Recall that we often begin by coaching people through the prone 1-arm trap raise first). Before you move, cycle through a full breath: inhale through your nose and exhale—fully—through pursed lips. Notice how that full exhale encourages your rib cage to descend and your deep core engages. On your next breath, as you exhale raise your arms, bringing your thumbs towards the wall. Aim for a bit of a “Y” shape rather than bringing your arms straight overhead (into the “11” position) at first. Again, this exercise—done without allowing the low back (or upper back or back of head) to come away from the wall—is a great self-assessment for overhead range of motion. The trick, of course, is that the hypermobile folks are often able to ‘cheat’ this test because their joint capsule allows greater glenohumeral motion, so even if the scapulohumeral rhythm is off, it will still look like they’re getting their thumbs to the wall. And it’s a great way to focus on ‘grooving’ scapulohumeral rhythm. 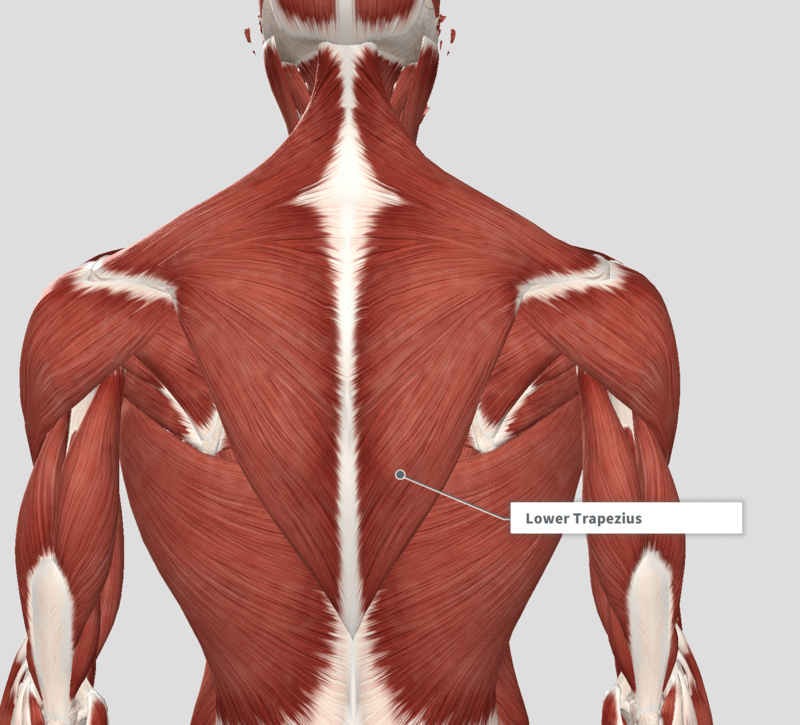 I find that people often feel this in a number of places, but if you feel the muscles in your mid-back, kind of near the inside bottom corner of your shoulder blades, those are your lower traps. One of my favorite exercises for serratus anterior activation is the Serratus Wall Slide. Set up as shown. The key lies in pressing away from the wall, through your shoulders and elbows. Because the “shoulders back and down” epidemic has not yet been eradicated, many folks are still suffering and as a result, a cue we regularly give is to “make space” in your upper thoracic spine area. That’s right: you can round your upper back a bit. We also use this cue with folks who have a rather flat thoracic spine because rounding the ribcage give the scapulae a better platform to move on. (Depending on how your look at it, the anterior surface of the scapula is a bit convex, so it needs the thoracic spine to be concave in order to move smoothly). As you glide your forearms up, you want to feel your shoulder blades wrap themselves up and around your ribcage (and kind of into your armpits). That muscle you feel working in and around the armpit area is your serratus anterior. The point to all of the above was to take another step towards making anatomy theory practical and real. 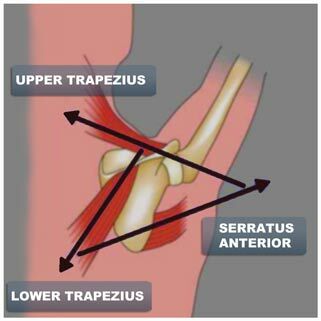 Scapulothoracic rhythm plays a very significant role in overhead mechanics and, as I’ve mentioned on one or two occasions in the past, having full functional overhead range of motion hinges upon having good scapulohumeral rhythm. And now, hopefully, you have a better idea of how that shows up in real life and some practical ideas about how to reinforce good movement mechanics. Now the big question, of course, becomes what if you or someone like you does not have full overhead range of motion? Why don’t you (or someone like you) have full overhead range of motion? The honest—and potentially frustrating—answer is I don’t know why your overhead range (or that of someone like you) is limited. I can certainly think of several possible reasons: It could be limited motion in the thoracic spine, it could be poor tissue quality in your rhomboids, traps, pec minor, or posterior rotator cuff. It could be some of those delightful neck muscles need some care. It could even be that you have some capsular tightness or it could be a faulty breathing pattern. This is the part where I editorialize about seeking individualized medical and/or athletic performance advice from the internet. Let’s start here: if you have a concern about the way your body is functioning, you will be best served by seeking out qualified, expert care. In the case of things like restricted shoulder range of motion, please stop just stretching it if you don’t know exactly what you are stretching and why you are stretching it. What you need is personalized, individualized professional attention (which, by the way, you are not going to find in the comments under a social media post). Admittedly, we have it pretty good here, just outside of Boston. When folks are feeling stuck, they have the option of setting up a time to meet with Theresa or myself for an assessment. Often times, by addressing some of the ‘usual suspects’, we can begin to make some meaningful and lasting improvements in range of motion. And when things get tricky—or there’s pain involved—we are fortunate to have a pretty great network of doctors and physical therapists that we can refer people to. We can probably all agree that going to see a really good orthopedic doc or a physical therapist is our ‘gold standard’. And we all simply have to appreciate that figuring out whether a physio is going to be worth seeing takes a bit of leg work ahead of time. (See Jen Crane’s guide here). A Functional Range practitioner could also help you. Certified providers of the Selective Functional Movement Assessment and/or Functional Movement Screen (look for FMS Level 2) can also help you to move better. And, of course, if you happen to be in the Boston area and want to look us up, please do reach out! There. Now: blog post done.